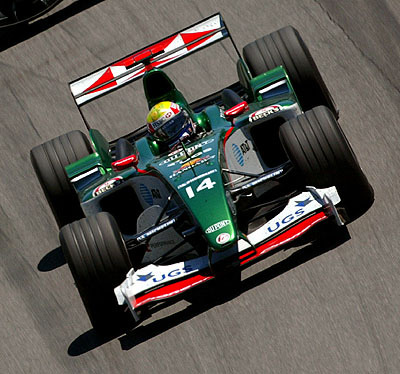 Will Jaguar be on the grid in 2005? Possibly not, and that's according to team boss Tony Purnell. According to Autosport magazine, at a recent meeting of team principals, Purnell was asked by Bernie Ecclestone if he could guarantee his team's participation in the 2005 championship. It's understood that Purnell couldn't answer in the affirmative. Asked to expand on his response, Purnell is alleged to have said that he was merely being honest and that there was nothing to prevent (team owner) Ford from having a sudden change of heart. Not for the first time. "I would be surprised if we were not here," he is quoted as saying. Purnell sights the fact that the team has recently paid out a lot of money for its windtunnel, and that therefore to pull out of F1 would be financial folly. Furthermore, the Milton Keynes outfit is currently advertising a number of job vacancies. Certainly the Jaguar dream hasn't worked out quite as expected, and this year the team appears to have taken a major step backwards. It's well documented that Red Bull is looking to buy a team, and the Milton Keynes outfit might be the best solution. That said, the team's recent criticism of Red Bull's management for insisting that Christian Klien fill the second race seat, rather than spending a year as test driver, is hardly likely to improve the relationship between the two. Furthermore, sponsor HSBC has already warned that it will be pulling out of team sponsorship at the end of the season. The loss of HSBC will create a financial void that must be filled, and certainly Ford won't be injecting any more dosh. Jackie Stewart is known to have been touting the Bank of Scotland to various teams, and most would think that a 'marriage' with Jaguar would be the ideal solution, but according to various sources, WilliamsF1 is the Scottish bank's primary choice. Attracting sponsorship is difficult at the best of times, however with your star driver (seemingly) heading elsewhere, and ninth position in the Constructors' Championship looming, Ford may indeed be weighing up its options.